Of course, it's always a pleasure watching you review new instruments; especially when you do comparisons. I thought I'd ask you a few questions about the newest instrument line you've added (Holstein Heifetz). 1) Can you explain what you liked about the Holstein Heifetz violins that convinced you to start carrying their instruments? 2) The Holstein Heifetz is now the 2nd most expensive violin you sell. You are always price conscious with the instruments you sell. What are the characteristics in this line of violins that a customer would fall for that may be missing in other comparably priced violins? 3) You've stated that the Holsteins are benchmade. Are they all made by the same luthier, or is it similar to MJZ where a group of experienced luthiers work under a master luthier? 4) Each violin is unique, even when made by the same luthier with the same wood. Putting that to the side for a moment, do you notice any differences (tone, varnish, setup, construction, etc) between the Holstein Heifetz vs MJZ and Scott Cao? 5) How did you encounter the shop that makes this instrument? Was it another case of a shop sending you violins to try? Or was this situation completely different? 7) Do you ever attend violin making competitions? @Bunkei: In case you didn't know, Pierre's last name is Holstein. I was digging around, "YouTube" this morning and found several video's of Pierre playing (other than what we see here in his instructional videos). One thing that caught my attention was a comparison between Pierre and Jascha Heifetz. Here are two video's, one of Pierre and Heifetz playing the same song. I noticed that in Pierre's video his left thumb never comes from under the violin neck, but Heifetz left thumb (at times) sticks way above the the fingerboard. Now I don't feel too bad when my thumb protrudes above the fingerboard. Oh, I'm really curious to hear the answer to number 6, lol. I would really like to see a Fiddlerman video review of the Holstein Heifetz 1740! Coming soon, I hope! Ahhh - great thread... and precisely why, I cannot quite put my finger on it, but the "Young Fiddlerman" reminds me vaguely of Commander Data from Star Trek ( Next Generation ) - - sorry Pierre - I was of course just kidding about that !!!!!! - your ability somewhat exceeds that of Brent Spiner !!!! Thumb placement in relation to the fingerboard wildly varies from one player to the next. My thumb placement is definitely similar to yours and Heifetz. It sticks way above the fingerboard. However, some violinists have their thumb directly under the fingerboard, and never moves to the side of it. Look at Anne Sophie Mutter's hand placement for an example. I remember seeing one of my classmates (who I admired) with a similar placement and tried it myself. It was the most uncomfortable thing EVER and wonder how she ever could stand playing in that position for more than 5 seconds. 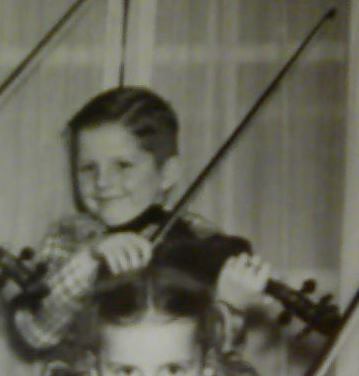 Thankfully my violin teacher at the time set me straight. Thank you also for the videos, and it's fascinating to see the differences in interpretation. Pierre plays some of the triple stops in reverse vs Heifetz. Loved it!! Ahhh - great thread... and precisely why, I cannot quite put my finger on it, but the "Young Fiddlerman" reminds me vaguely of Commander Data from Star Trek ( Next Generation ) - sorry Pierre - I was of course just kidding about that !!!!!! - your ability somewhat exceeds that of Brent Spiner !!!! We found a maker that makes incredible instruments comparable to the best instruments we have ever seen or heard. They are also super consistent compared to a lot of the well known great violins. These instruments are bench made from very well seasoned wood, oil varnished, and very reasonably priced. The work, cost, time, and investment to advertise these instruments will be lost if we give the luthiers name at this time. We are in the process of getting a contract signed with him to buy all his instruments, but if we reveal his name at the same time, players, distributors and dealers would contact him to buy directly. That would not only eliminate our chances of obtaining enough instruments but drive the price up for everyone. They are as good as any new instrument I have ever played on in my life. The Holstein Plowden is as well. Overtones, easy open playability, projection, a great blend of dark to mid range tone. Just an overall great success rate with all the instruments that we have purchased so far. We have been buying them all from this one maker. We're amazed at the ratio of great sounding instruments. They all look fantastic. I have managed to get some connections who have encouraged us to order instruments from different makers. This is one of the few makers that came through. Even though most people see me as an easy and positive reviewer, I condemn most instruments that I test. Of course value is always a very important factor to play in. I can test 100 instruments before one impresses me and then I want to see a few more to make sure it wasn't a fluke. I would be content with any Holstein violins (thus the reason for giving them our name) and many of the Ming Jiang Zhu violins. Bare in mind that we don't keep them all to sell. We choose our favorites and spend hours on set-up and special adjustments. Strangely enough, no. It's always interested me but to be honest, most of the winning violins at those competitions out of the reach of the online customers that we deal with at this time. When we discover a violin maker who isn't well connected and hasn't won any competitions we have a great value product. As soon as a violin maker does well at a well known competition, the price increases many fold. Exactly. And to top it off, we have a 100% satisfaction guarantee. We only offer that because we have confidence in what we are offering. The instruments come with very nice certificates with pictures. They are works of arts in themselves. There are more to come. Exciting times for us at Fiddlershop. Bravo! Thanks for the answers @Fiddlerman ! @Fiddlestix was kind enough to tell me that Holstein is your last name, which really speaks volumes for this maker. To put your own name on anything you sell .. there is no other way you can display more confidence in a product. And yes, I'm interested in the Heifetz. The comparison(s) you did with the Heifetz/Plowden vs MJZ 925 vs Scott Cao was quite eye opening. The difference in the timber, particularly in the middle (D and A) was quite noticeable. It's a hard decision because the 909 has sentimental value as it's one of the last violins that bears Mr. Zhu's signature on the certificate. Just to make clear: I LOVE my violin. I have said and keep stating that it is unbelievable the power this violin has. It is a true professional, and would not hesitate to recommend it. Heck, I'd recommend it to famous violinists who perhaps wants a second instrument in case their prized Strad or Del Gesu is damaged or stolen (Heaven forbid). However, I feel obliged to support up and coming makers who make instruments that affordable to the masses, but can compete with the likes of the established names that are 5x-10x the price. I always felt that the well known makers should make instruments for the next generation of violinists without the huge price tag. Perhaps they could use slightly more inexpensive wood, etc so it doesn't affect their ability to sell their coveted flagships. As it stands, I will support makers that may not have the recognition, but the quality is no less impressive. At the same time, they're not looking to gouge the consumer. Just saw this post and checked out Fiddlershop. Look like there are now 4 different Holstein violins, 3 of which are priced in the higher range, are they all from the same maker? Fidderman, can you comment on those 3, what are some differences between them? Are you expecting more models from this maker? The workmanship in these instruments is consistently fantastic. The more expensive versions are bench made by one maker. The quality of wood is about the best I've ever seen, and I've seen a lot of violins. It is to me like purchasing a work of art as well as a great violin. We are presenting certificates with pictures for insurance purposes and to protect against fakes. We'll register every instrument for the same purpose. As you guys can imagine, we can't reveal the name of the maker for the obvious reasons. We will be doing a lot of advertising to build the reputation of the instruments and can't afford to compete with some of the huge retailers. Wholesalers and retailers alike would quickly contact his shop for direct purchases. If his name were to come out, the price would unfortunately go up a lot compared to other instruments that I have seen at this quality level. You guys will begin to see reviews by some of the buyers eventually. The response has been fantastic. The models that we are expecting were ordered 3 months ago, since it takes at least that long for these instruments to be completed. I'm making a prediction that you will be hearing a lot about Holstein Violins around the country in the coming years. 🙂 We'll try to keep the price as low as possible for as long as possible. Hoping the maker will stay true to us as long as we treat him right. So far we are mutually happy. This is good to know Pierre. I am happy for the success of the Fiddleshop!!!! That's terrific, looking forward to all the amazing instruments that are being offered. Pierre, do you find certain sound characteristics follow the instrument they copy (ie do all Plowden violins sound alike vs Heifeitz vs Pannette) or are the sounds more dependent on the individual instruments? Do you have a favorite Holstein so far? That is a great question. Not really but the Bench violins are the best. I keep changing my mind about which ones I like the best because they have their own special character. We just had an old friend visit us this evening and took out 5 of our Holstein violins, mixed. He had a hard time picking a favorite but he told me that they are all better than his violin. He was a full time professional violinist in the Florida Philharmonic years ago, who had studied with Ruggiero Ricci back in the day. He choose two to take home, a Heifetz and a Plowden. 🙂 We have 6 on their way that just cleared customs. Can't wait to test them. wow.. what a great testimony! !